Thiago (l.) has been one of Carlo Ancelotti's (r.) key players as Bayern have swept to a fifth consecutive Bundesliga title. Robert Lewandowski leads the Bundesliga goalscoring charts; Robbery has returned with a vengeance; Coach Carlo Ancelotti has now won league titles in Italy, England, France, Spain and Germany; and Bayern Munich have raced to a record 26th Bundesliga triumph; yet perhaps the biggest Bavarian success story of the 2016/17 campaign has been the emergence of Thiago Alcantara as a genuine world-class talent. Not that the Brazilian-Spaniard's ability had ever been in any doubt. The 26-year-old arrived at the Allianz Arena in the summer of 2013 at the behest of Ancelotti's predecessor Pep Guardiola, who said of his pursuit of the then-Barcelona starlet: "I spoke to the club and told them about my concept and told them why I want Thiago. He is the only player that I want. It will be him or no one." His trophy haul didn't slow on arriving at Bayern, with this year's Bundesliga title his fourth, to squeeze alongside two DFB Cups, one German Supercup, one UEFA Super Cup and one FIFA Club Word Cup in an increasingly cluttered trophy cabinet. His time on the pitch did not maintain the same pace, though. Injuries hindered Thiago's progress initially, with his first three years at the club disrupted by a knee ligament tear, followed by a broken ankle and then some fierce competition at the heart of Bayern's midfield, first from Toni Kroos, Bastian Schweinsteiger and Mario Götze, and then current teammates Xabi Alonso and Arturo Vidal. Enter Ancelotti. The Italian - the only coach to have won the Champions League three times - has been proven right with some of his tactical innovations. Where the left-footed Douglas Costa and right-footed Kingsley Coman occupied left and right flank respectively last term, Ancelotti has reverted to inverted wingers, with Franck Ribery and Arjen Robben cutting inside and combining for 15 goals and 17 assists to date. The biggest departure from the Catalan's preferred set-up, however, has been the shifting of Thiago from central and sometimes even defensive midfield to a free role behind Lewandowski at the point of the champions' attack. The 20-time Spain international still wears the number 6 on his back, but now that is purely ceremonial. "I've never seen such a good relationship between coach and player as with Carlo," Thiago commented when pressed on Ancelotti's arrival in July. "That's what the Real Madrid players have already said and they told me that before he arrived." And so it has proved, with jaw-dropping results. Thiago and Dortmund's Julian Weigl are the only two midfielders to have a pass completion percentage of 90 or better in the division this year, but Weigl operates at the base of BVB's midfield. The fact that Thiago has to contend with markers in the final third, as well as attempting adventurous balls to unlock opposition defences, brings such a number into sharper focus. Thiago, with his touch, imagination and distribution, is in a league of his own. Only Lewandowski and David Alaba have racked up more minutes among Bayern's outfield players. 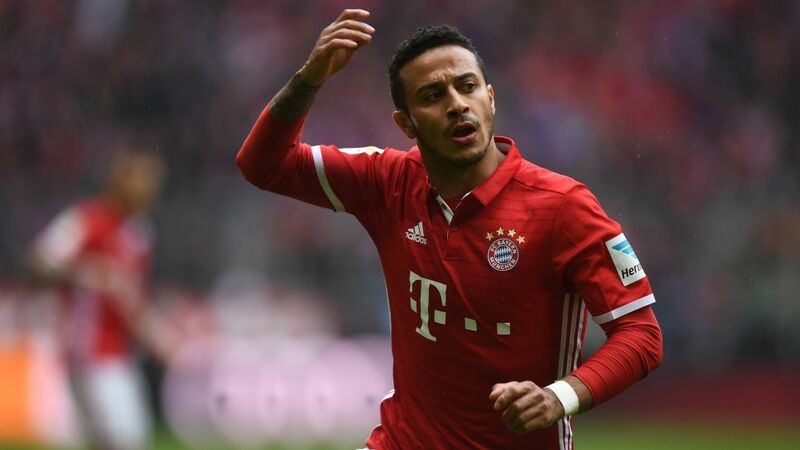 After scoring four goals in his first three years at Bayern, Thiago has enjoyed five goals and five assists this season - which have included game-winning contributions against title rivals RB Leipzig, as well as European aspirants Hertha Berlin and Bayer Leverkusen. He has averaged 119 touches per game, and has added some steel alongside the obvious silk, winning a personal-best 60 per cent of his challenges. "My family and I feel very happy in Munich," said Thiago on extending his contract at the Allianz until 2021 last week. "Everything suits us here. I won't leave Bayern before winning the Champions League." Ancelotti's maiden season at the Bayern helm has been a resounding success, but perhaps his biggest achievement has been to mould Thiago from a talented player who seemed destined to never quite fulfil his potential into a midfielder dominating every game he plays, and - terrifyingly for his opponents - it seems from Thiago's words that the best is yet to come. Would Thiago make your Team of the Season? Have your say below!